Getting married means entering to new life. Everything will be new including financial life. Married couple sometime get confused when they come across financial jargons. 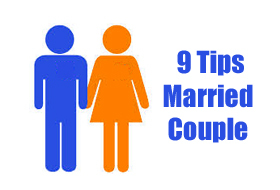 In order to help them we are herewith 9 Tips for married couple for good financial life. You should plan and discuss money matter with your better half. Your better half should be aware about overall financial situation and financial product purchased by you. You must add your wife as nominee in all investment done by you. You should be ready for any kind of emergencies. Make emergency fund and have at least 6 month expense as emergency fund. You should make financial plan jointly. Your financial plan should contain short-term and long-term financial goal including way ahead to achieve the same. You should start planning for your retirement at early stage. Invest at least 20% of your income for retirement. Select good investment option like PPF, Mutual funds for investment. Purchase good life insurance policy. Life insurance cover should be big enough to replace your income. Best insurance policy is term plan. Here is comparison of 27 term plans. Health Insurance is must for any family. You should purchase family floating plan for your medical needs. This plan is over and above health insurance provided by your employee. You should avoid taking debt. Don’t take any debt to fulfill your person requirement like vacation, club membership etc. If you use credit card make sure you clear credit card dues on time. If you are living in rented house you should plan to purchase House. Carry out due diligence before buying home. If you are taking home loan EMI should not be more than 35% of your take home salary. Working couple should purchase home on joint name to take advantage of tax benefit on home loan. Do follow us on facebook.